Data-driven: Current apps are packed with data, but most of the time the developer is the only one who can see it. A recent trend in the speech language field is pulling the curtain back on data and allowing clinicians to see a client’s data. This data includes information like what tasks a client has completed, when they completed them, and if they got the answer right or wrong. This information is helpful for clinicians who are trying to structure a specific activity plan for a client. Easy-to-use: Apps sometimes require a log-in process. Check to see if the log in is confusing or lengthy, as your client could get easily distracted or frustrated. Be sure to evaluate the sign-in screens and get started buttons before you recommend the app for a client’s at-home use. Accessibility: Some applications are only compatible with certain hardware like Apple or Android. Make sure the application fits with the device your client has access to on a regular basis. Therapeutic Benefit: Many clinicians like to know that the app they are recommending is backed by some research or clinical knowledge. We agree! You can always check the credentials or background of the app developer to ensure the content and quality of the app meet your professional standards. Confidence Level: Before you recommend an app for at-home use, work with your client to ensure they are confident using it. Although the first attempt can be tricky with continued use your client should be confidence navigating the app and performing the appropriate tasks. Independent Use: Mobile applications that use complicated interfaces or challenging tasks might not be a good fit for your client. Monitor your clients’ abilities to use the application independently and check to see if you can alter the settings or adjust the difficulty level. Clinical Recommendations: Find out from your peers if they have tried a certain app and get their feedback. Often times, other clinicians have strong opinions about applications and can provide positive and powerful feedback. Cost: Mobile applications can have associated fees. 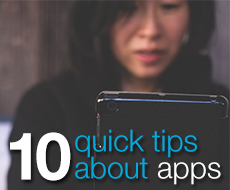 Be sure to check the subscription plan or app fee before you download or recommend to a client. Also, check to see if the app offers special features or services for ASHA-certified SLPs. Updates: Analyze how frequently the app is updated. This information will let you know if your client will receive updated content. Market Analysis: Both Google Play and the App Store have more than 1.3 million apps each. Chances are you can find an appropriate application for your clients who use Apple and Android devices by narrowing your search to education, medical or health apps only. You can also read reviews on each app before downloading. Take these tips with you next time you’re on the lookout for some new applications for your practice.